High strength thermosetting plastic composites provide static strengths comparable to some metals while having densities slightly greater than water and an acoustic impedance comparable to aluminum. To evaluate their use as ultrasonic resonators measurements were made of their density, extensional sound velocity and elastic constant. To determine their utility and limitations as ultrasonic horns operating at substantial displacements and stress their Q was also measured at stress levels in the range of 50 MPa (7300 psi) at 20 kHz. It was found that one of these materials, although more costly than metals, may serve well as a replacement for metal horns for output displacements in the range of 75 microns (3 mils), peak-peak at 20 kHz, particularly in applications where low weight and long length is desired. 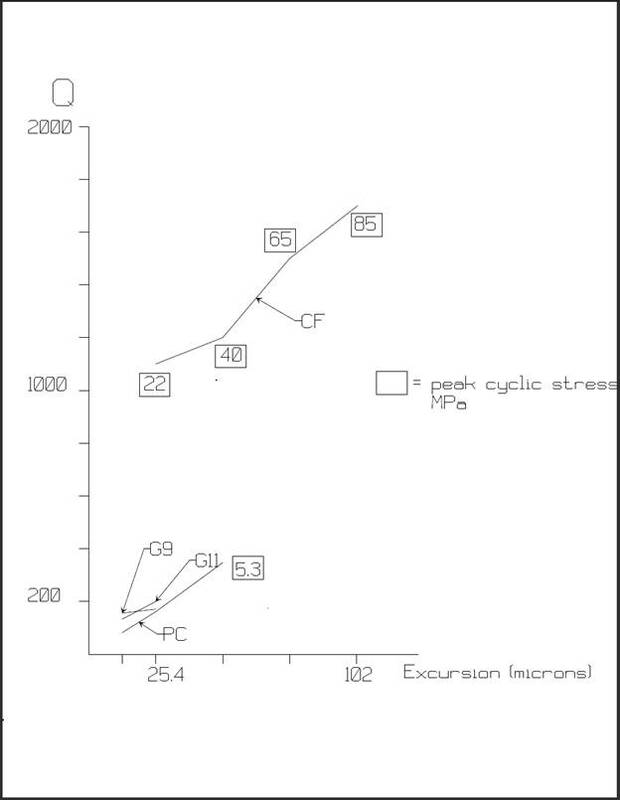 The cyclic fatigue strength of many thermoplastics is available from a number of sources. 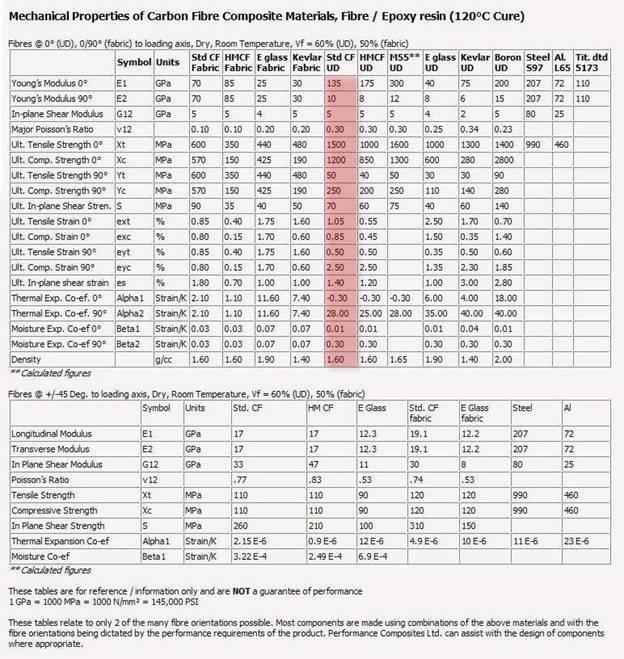 However these data were obtained almost exclusively using bending or torsional strain at frequencies in the range of 1-10 Hz. Niermac reported measurements of the Q of polymers at imposed cyclic pressures below 1 atm at a frequency of 1500 Hz. The properties of thermo and thermosetting plastics at substantial strain at ultrasonic frequencies have been sparsely evaluated. Menges and Barbari studied cyclic loss in polycarbonate and polypropylene at 20 kHz at strains in the range of 0.002. Earlier, Mason evaluated, at a frequency of about 18 kHz, the Q and fracture strain of Bakelite. His apparatus is shown in Figure 1. His acoustic arrangement is followed in this report. Because of ease with which modern thermosetting composite plastics, which offer static strengths substantially larger than thermoplastics, can be formed and cured into complex shapes they are an attractive candidate for mass production as ultrasonic horns. A comparative evaluation of their dynamic modulus and acoustic loss at ultrasonic frequency at strains of practical interest where their use, for example, in producing cavitation initiated sono-chemical reactions for consumer and industrial products, may assist their consideration for use in such applications. This report relates an evaluation, in the regime of practical interest, of three such composites: G9, consisting of a woven fiberglass fabric impregnated with a melamine resin; G11, fiberglass cloth impregnated with an epoxy resin; unidirectional carbon fiber impregnated with a bisphenol epoxy resin. For purposes of reference, an evaluation was also made of unfilled polycarbonate for comparison with Menges’ report made under similar frequency and strain conditions. Computation of the elastic modulus of the materials was made by measurement of the frequency of their first free-free flexural vibration. Although this method can be readily employed for metal samples in lengths of as little as 15 cm (6 in. ), composites, having a much lower Q, require much longer sample lengths, on the order of 100 cm, so that the duration of vibration is sufficiently long to permit measurement. By suspending the sample at each of two nodes of vibration, located 22.4 percent of the sample’s length from each end, and striking its center the frequency is read from an oscilloscope or frequency meter connected to a microphone held in proximity. Figure 2 illustrates test arrangement. Table 1 summarizes the measurement results. For purposes of comparison, the values for 6Al-4V titanium have been included. Samples were then cut from stock rod having a length, ls = c/2f, computed to be equal to a half wavelength of extensional resonance at 20 kHz. Figure 3 is a photograph of three of the samples. Note the disparity in lengths between the samples. A 20 kHz piezo-electric transducer equipped with a 9:1 velocity transforming stepped horn was provided for the tests. This transducer was driven by a power amplifier whose input was provided by a variable frequency and amplitude sinusoidal signal generator. A high frequency watt meter (Clarke-Hess Model 255) was connected between the power amplifier’s output and the transducer. 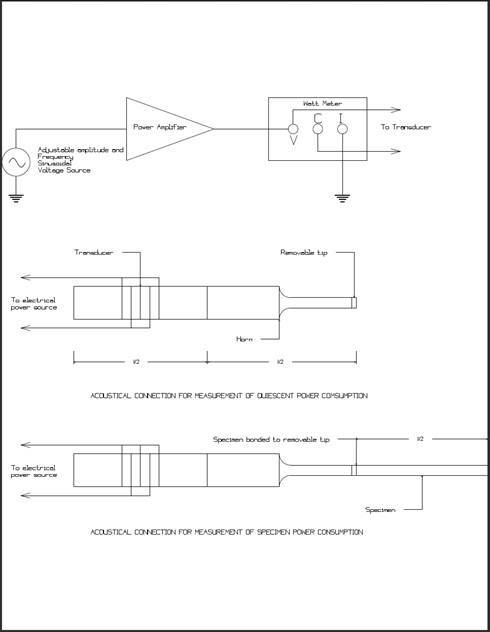 The schematic test setup is shown in Figure 4. Note that the watt meter is connected to register only the power consumed by the transducer and not that as well consumed by the meter’s current sensing shunt. As such, it’s reading of real average power delivery to the transducer appears negative. 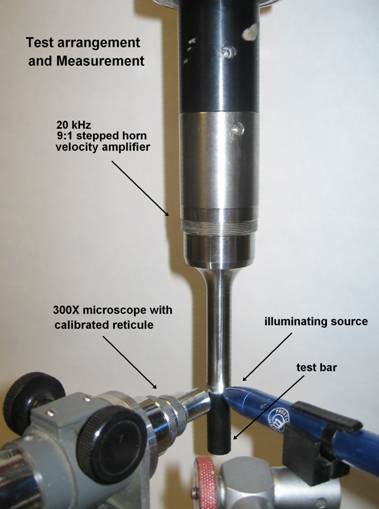 Prior to attaching a specimen, the power consumption of the transducer-horn combination was measured at various vibration amplitudes, as determined by a 300X microscope equipped with a calibrated reticule, at the free end of the horn, which contained a removable tip. The vibration was measured at the maximum stroke point in microns (mils) peak-peak. The equipment arrangement is shown in Figure 5 with a specimen in place. The horn with the tip attached was resonant at 20.0 kHz. Following measurement of the power consumed by transducer and horn, the tip was removed from the horn and bonded to a sample using Emerson and Cummings Eccobond G909 structural epoxy. This high strength epoxy cures at 100 oC, a temperature unlikely to affect the structure of the specimens. The power consumption at maximum stroke and the resonant frequency was measured for successive increases in vibration amplitude. 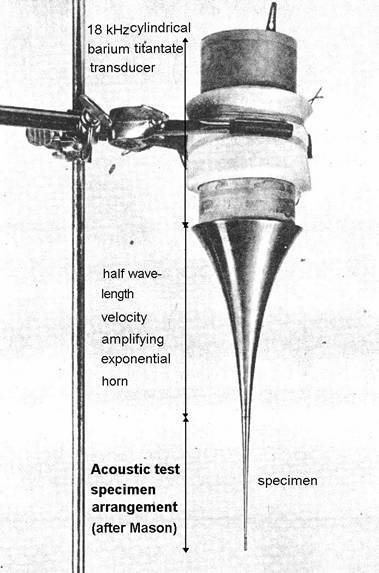 This computation assumes that the resonant frequency measured for the transducer-horn system remains the same when the specimen is attached, a condition that prevailed within 0.1 percent during testing. The Q obtained at successively increased excursion in each of the samples is shown in Figure 6. The value of Q obtained for polycarbonate is in approximate agreement with that of 100 obtained by Menges3. Both epoxy composites, G9 and G11, exhibit similar values which compare rather starkly with those obtained for Titanium of 20,000. 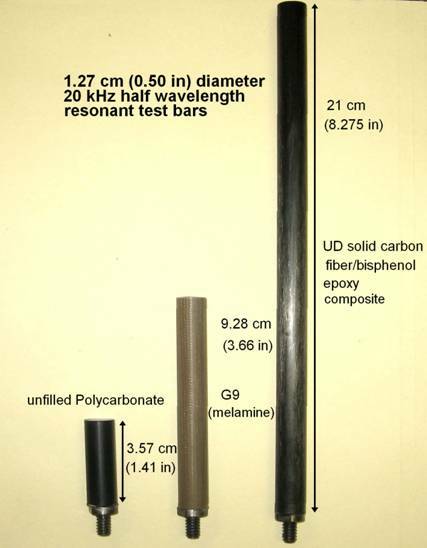 Clearly the uni-directional carbon fiber sample exhibits much lower acoustic loss than either of the fiberglass-epoxy composites or polycarbonate. The author has found, however, that polycarbonate is capable of continuously surviving operation at 20 kHz cyclic stresses of approximately 1.4 MPa (200 psi) if provision is made, given the low thermal conductivity of plastics compared to metals, for cooling the material. This level of stress amounts to an excursion of 15 microns (0.6 mil) in a right prismatic extensional half wave length resonator. Because both G9 and G11 exhibit an increased sound velocity compared to polycarbonate, their half wavelength substantially exceeds that of polycarbonate. As a result, the power required to maintain vibration above 50 microns was beyond the electrical drive capability of the testing equipment. It appears that these materials may be capable of sustaining vibration levels larger than those measured here but, even at the 15 micron level, given their greater volume their power consumption is about 2.5 times that consumed by polycarbonate in half wave extensional resonance. It seems likely that carbon fiber is capable of continuous operation at larger cyclic stresses, in the range of 70 MPa, corresponding to an excursion of 75 microns (3 mils), especially given its thermal conductivity, even in the direction perpendicular to fiber length, in the range of 0.9 W/mK compared with the value for polycarbonate of 0.2 W/mK. Thermal conductivity in the direction parallel to the fiber length is at least 40 W/mK, comparable to martensitic stainless steels. In addition, CF is electrically conductive. The mechanical properties of carbon fiber composites are shown in Figure 7. Of note here is the anisotropy of the UD material. The modulus in the direction perpendicular to the fiber orientation is a tenth that in the aligned direction. Horn should there be designed so that direction of principal strain is coincident with the fiber lay. For example, in constructing blade horns, CF slab blanks are normally made by laminating thin sections of composites each having the carbon fibers uniformly aligned in one direction. This direction should correspond to the direction of principal strain. When considered for use as half wavelength resonators the disparity in wavelength between CF and the metals, such as titanium or aluminum, of which connected transducers and horns are commonly made, must be taken into account. Threaded connections are thus subject to differential movement between a metal stud and the carbon or other plastic resonator. It has been found experimentally that connections are durable when the stud itself is made of the same plastic material used for the resonator or is made of a material having the same wavelength as that plastic. Malcolm, M.N., A guide of better testing of plastics, Plastics Engineering 30(4), April 1974, pp.71-78. Determining the dyamic bulk modulus and elastic-loss factor of polymers from acoustic measurement, Niemiec, J.M., Naval Ship Research and Development Center, Bethesda, MD 20034, Document AD752483, October 1972. 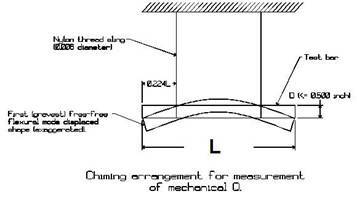 Material characteristics required for ultrasonic welding, Menges, G. and N.El. Barbari, Kunststoffe – Plastics, September, 1987, pp.23-27. Physical acoustics and the properties of solids, Mason, W.P., D. Van Nostrand, 1958. pp. 172-178. See Fundamentals of Acoustics, Kinsler, L.E. and A. R. Fry, 2nd Ed., John Wiley, 1962, p. 76.